Have you ever wondered when the future will arrive? Sure, we have smartphones, cryptocurrencies, solar and wind energy, and a treasure trove of solutions to many of the major health issues. But there’s something missing. There’s an essential element of the future that just hasn’t hit yet. The jetpack. The spaceship. The personal aircraft. Despite our unbelievable pace of technological breakthroughs, it won’t quite feel like the future until we are up in the air. We’re on our way in Arkansas. There is a strong community of individuals and organizations that are actively working toward creating a future with more personal aircraft opportunities and adventures. A backcountry aviation boom is in motion. There are serious steps underway that will directly lead to that future we all have dreamed of - one that’s up in the air, independent, and free to go and play, thousands of feet above the ground. 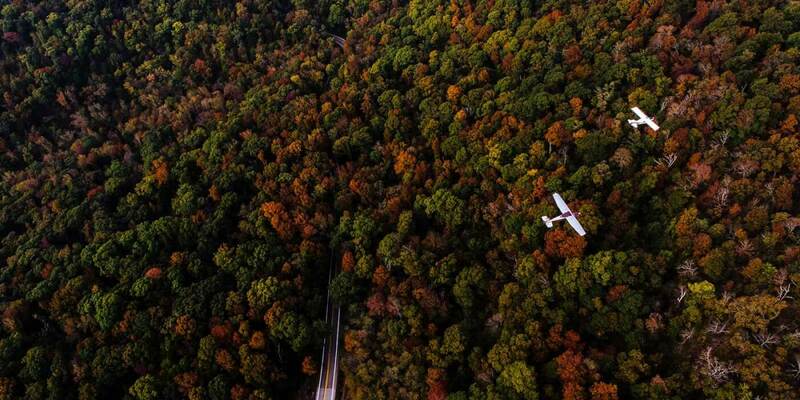 The stage is set for backcountry aviation to break out in a big way in Arkansas. In general, backcountry aviation is starting to pick up in the US. Flying is beginning to be seen by more people as not just a utility - a way to get from A to B - but also as a recreational activity that affords the opportunity to experience aerial movements, flightseeing, and backcountry aviation throughout challenging, natural environments. The backcountry aviation trend has really grown out West and is anticipated to continued to grow in Arkansas due to its natural advantages for aviation. Arkansas is at the center of the United States, so it is accessible to the country’s entire aviation community. It sits at a lower altitude than many of the prominent backcountry aviation sites in the West, which provides for a greater performance margin for small aircrafts. Just like the Ozark Mountains created an organic opportunity for undulating, high quality mountain biking trails, these environmental advantages create a world class opportunity for backcountry aviation in Arkansas. The backcountry aviation movement in Arkansas really started to take off in 2012, when a change to the Arkansas Recreational Use Statute was made, the bill that protects landowners from the liability associated with allowing certain recreational activities on their land. The term “aviation activities” was added to the list of outdoor activities protected under the statute. This change cleared the way for the roughly 300 private airstrips found in Arkansas to become accessible to the backcountry aviation community of passionate pilots and guides. Flash forward to today, over 60 of Arkansas’ backcountry airtstrips on private land have been linked, digitized, and made available to the public through the information rich Airfield Guide. To give yourself a good idea of the kind of adventure you can have with these airstrips, explore the Fly Oz, The Ozarks Air Trail feature here to see many of the remote mountain biking, backpacking, floating, fishing, and restaurant dining available to travelers. Progress is happening on the ground level too. Northwest Arkansas’ comprehensive flight school and maintenance facility, Summit Aviation, is experiencing steady growth, training and certifying an increasing number of new pilots each year. Summit runs its operation out of two facilities, one in Springdale and one in Bentonville. More than anywhere else, Summit Aviation produces tailwheel pilots that can handle the tailwheel planes better suited for landing on grass strips. This allows pilots to fly to and arrive at the many areas of remarkable natural beauty available throughout Arkansas, like the Buffalo National River. Chad Cox, Summit Flight School Manager and Aviation Director for Runway Group, reports that most people coming to learn to become a pilot are looking for a challenge and fresh opportunity for adventure. With this in mind, Summit maintains a flying culture that intends for every flight to be safe, fun, and challenging. And for those willing to take the plunge in aviation life, there are many more exciting opportunities available to pilots ahead in the future. The Bentonville Municipal Airport, known to many as Thaden Field, (named to honor Louise McPhetridge Thaden, an aviation pioneer from Bentonville) is on a clear path to become the regional basecamp for recreational flying. The relatively recent addition of a grass runway allows individuals to practice taking off and landing from turf. Midway through construction is the appropriately named Fieldhouse that will have a restaurant, aviation informational center, and a retail store for outfitting people wanting to explore a growing number of airstrips. There’s even a “flying club” in the works. The NWA flying community is empathetic to the fact that owning planes, insuring them, and storing them in a hangar adds up fast. It doesn’t make sense for most to own a plane if you are not using it at the frequency you would a car. So, the aviation community is developing a club that makes it more affordable for aspiring pilots to access the craft and information they need to get in the air. For good reason, Arkansas’ backcountry aviation opportunities have been featured in a number national publications. And it’s only the beginning. Just as OZ Trails linked and brought identity to NWA’s world class network of mountain bike trails, FLY OZ has been established to connect and market our exceptional network of airstrips available in the region. All this aviation activity adds up to a present opportunity that feels a lot like the future we’ve all been waiting for, one with a strong aviation community that makes it more and more accessible and realistic to get up in the air, fly and personally explore the airways. 2018 is going to be a big year for flying in Arkansas. Join the community today. Devin is a student, writer, naturalist, entrepreneur, and community developer. His passions lie in the outdoor recreation, philosophy, classical studies, science, technology, wellness, and spiritual ecology space. He has been actively exploring the outdoors via backpacking, fly fishing, and yoga retreats over the last 10 years.